Cheesecakes with butter cream frosting make for a delicious and beautiful Valentine dessert. The inspiration for icing the cheesecakes came from The Strip House, which is a very nice steakhouse that features a three layer cheesecake. Between the layers of cheesecake is a butter cream frosting that holds the cheesecake layers together. 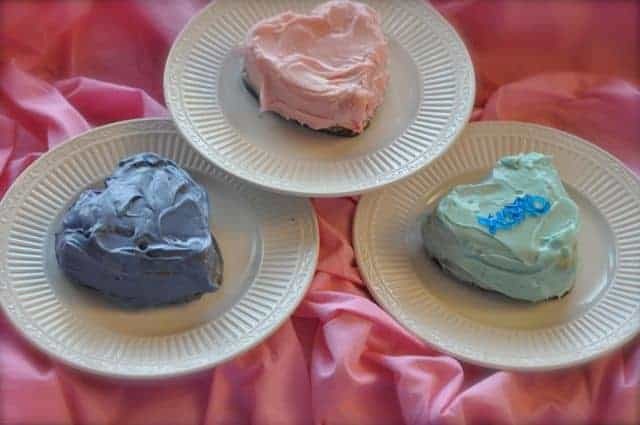 For these cheesecakes I used these heart molds from Wilton, you do not need to use these pans, you can simply bake cheesecake in a normal cheesecake pan. This recipe will make 5 to 6 of these cheesecakes. Cheesecakes never tastes so good until you added buttercream frosting to them. To make the crust, generously grease a 9x2 springform pan with butter. Place pan in center of a 12 inch square of aluminum foil and press foil up around the side of the pan. Combine graham- cracker crumbs, sugar, cinnamon and melted butter in a small bowl until well blended. Press crumb mixture into bottom and side of the pan. Chill prepared pan while making the filling. To make the filling, with an electric mixer on low speed; beat cream cheese in a large bowl until soft. Gradually beat in sugar until light and fluffy. Beat in egg yolks one at a time, until well blended. Stir in sour cream, flour, vanilla, lemon rind, and juice until smooth. Beat egg whites until they hold stiff peaks. Fold white into the cheese mixture, until well blended. Pour into the prepared pan. Bake at 350 degrees for 1 hour and 15 minutes, or until top is golden brown, turn off oven and allow to cake to cool for 1 hour. The cheesecake is done when you remove the cheesecake and there is still a slight wiggle in the center of the cheesecake. Remove cake from oven and allow to cool on a wire rack at room temperature. Chill overnight before serving. If you are using the small heart-shaped pans, the baking will be between 45 minutes and 1 hour, check the cheesecakes for their doneness by giving them a little wiggle and seeing if the center is set. Butter Cream Frosting Instructions Beat butter for a few minutes with a mixer with the paddle attachment on medium speed. Add 3 cups of powdered sugar and turn your mixer on the lowest speed (so the sugar doesn’t blow everywhere) until the sugar has been incorporated with the butter. Increase mixer speed to medium and add vanilla extract, salt, and 2 tablespoons of milk/cream and beat for for 3 minutes. Add food coloring if desired. Remove cheesecake from mold, and then gently frost the cheesecake. The Butter Cream recipe was slightly adapted from the SweetSavoryLife blog, whose technique of sifting the powdered sugar makes all of the difference when making a butter cream icing. Comfortably, the recipe is really delicious on this precious topic. So cute! And they came our so great! My family really enjoyed them!